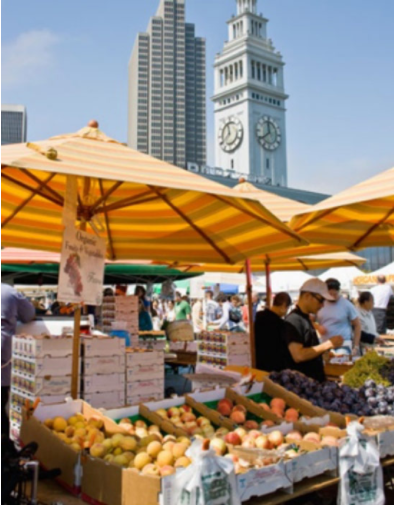 The Ferry Plaza Farmers Market – One of the most recognized and admired markets in the nation, The Ferry Plaza Farmers Market is not one to be missed, and less than two miles away from OMB. Not only does this market offer a myriad of fresh produce and artisan goods, but also serves as an environment for people to learn more about food and agriculture. Insider tip – on Saturdays, there’s a big chance you’ll see some of San Francisco’s best-known chefs cooking alongside a variety of food vendors. Be sure to bring your appetite! Open Saturdays from 8-2pm and Tuesdays & Thursdays from 10am-2pm. Heart of the City Farmers Market – Located in the United Nations Plaza, the Heart of the City Farmers Market is San Francisco’s only independent, non-profit, farmer-operated market. Also close to OMB (just two miles), this market is often called the “people’s market” because of how diverse and grassroots it is. Patrons can find fresh and affordable produce, with an emphasis on Asian ingredients. Open Sundays from 7am-5pm and Wednesdays from 7am-5:30pm. Mission Community Market – Bartlett Street and 22nd Street close down on Thursdays and transform into an open-air community marketplace full of farmers, local businesses, music and culture programming, and after-school activities. Offering an assortment of vendors ranging from fruits and vegetable, cheesemakers, and bakeries, the Mission Community Market is the perfect place for fresh produce and family fun. Open Thursdays from 4-8pm.